Grumpy Edinburgh hermit Simon Debovar discovers his living room carpet is the deciding factor in a bet between God and Satan. When it’s stolen, he’s forced into a world of angels, demons, witches and immortals to get it back. If he fails, he’s probably dead; if he succeeds, it could be worse! Will Simon be able to get his living room carpet back and restore the balance between the angels, demons and immortals? Or should Simon just cut his losses and accept his probable death? To help us and Simon decide what do to, Justin Lee Anderson, the author of ‘Carpet Diem: or How to Save the World by Accident’ has joined us today. Justin, it’s not every day that I get to talk to an author about how a carpet is going to save the world. What inspired you to explore saving the world through upholstery? A comic, actually. Specifically, Sandman #17, Calliope. In the story, *SPOILER* a writer is cursed with an endless flow of ideas. They are really off the wall things like a man winning a historical date in a bet. And these mad ideas juxtaposing unusual things got me thinking in a different, lateral way. The idea of someone’s carpet being the subject of a bet between God and Satan came to me on a walk, and the rest of the book developed from there! *Laughs* What an awesome comic and walk! Now, I’m thinking when you got your lateral thinking powers kicked into high gear, the situations might have started to be a little far-fetched for some people. Did you try and inject a little of your own life into the tale to ensure that it had a degree of reliability? Yes, lots. Which probably sounds mad considering the plot, but I like to think there’s a lot in there about friendships, relationships, and just life, that all draw on my own experiences. I think there’s a lot of me in the book, in general. Some of it in the characters, some more directly in their dialogue, or in the narration. I suppose that’s probably true of any writer, but I think anyone reading Carpet Diem would have a least a decent idea of what kind of person I am, and what’s important to me. What kind of important ideas do you feel that you really showcased in ‘Carpet Diem’? I think the biggest one was that I *could* write a book. It took me more than ten years to write, I think because I never really believed I would finish it, or that it would ever be published. The fact that I did, and it was, was huge for me. Congratulations on making that huge milestone! I’m so glad that you pushed through your doubts to bring this book to eager readers around the world! As you look back on those ten years of writing, do you feel that you found the writing process energising, or was it more exhausting? Both. I remember being asked by an online writing course about 20 years ago why I wanted to write, and I answered that I needed to write because it felt like breathing again after being stuck underwater. I’ve never managed to come up with a better metaphor than that. It’s invigorating and fulfilling, but also terrifying and exhausting. That’s a pretty clear metaphor – I’d stick with it! With writing being such an integral part of your being, and the solid proof from ‘Carpet Diem’ that you can get your work published, have you centred your invigorating and terrifying feelings about writing onto a new project? I’m writing the first book of a planned trilogy called Eidyn. It’s a more traditional swords and sorcery fantasy, which isn’t funny (not intentionally, anyway). The first book is called Draoidh (Gaelic for magician) and I’m just over halfway through it. When I finish this book, I’m planning to write a sequel to Carpet Diem, before writing books 2 and 3 of Eidyn. Draoidh, what a wonderful choice for a title! I love it. Is that your favourite word? You’re just trying to guess my password, aren’t you? *Laughs* It wasn’t my first thought, but now that you mention it your password would sure be handy! Since you don’t want to spend the rest of your day changing passwords, let’s return to something you probably know really well. Comic and superheroes. What happens if Batman gets bitten by a vampire? This comic actually exists. It’s called Batman Vampire. Which just goes to show, there are no new ideas! Well, people say that there are no new ideas, but I haven’t heard of carpets being the object in a bet between God and Satan before, so I still there are a few unexplored frontiers out there! And before I let you return to those frontiers, can you share a little taste of the wilderness explored in ‘Carpet Diem’ by sharing your favourite line from the novel? She had a sensuous Southern drawl that made Simon think of hot summer nights, white cotton shirts, repressed homosexuality and insidious racism. That’s quite a drawl! Meet the woman behind the drawl and more in ‘Carpet Diem: or How to Save the World by Accident’ today! Excited to read the book we discussed today? Find it here on Amazon: ‘Carpet Diem: or How to Save the World by Accident ( ASIN: B07DXCX4KF )‘. 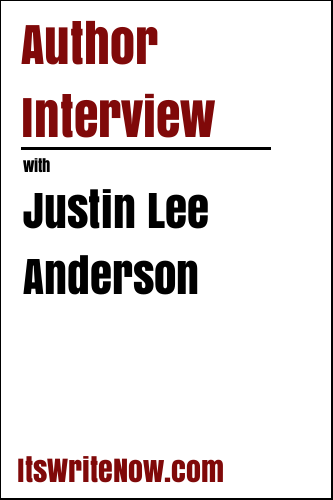 Want to find out more about Justin Lee Anderson? Connect here!